There is plenty of nuance and complexity to the current goings-on in Congress, with countless reams of paper and barrels of ink being devoted to its explication on a daily basis. However, for those who live outside the beltway or don’t hang on every word uttered by Congressional leadership, the best description of what’s happening on Capitol Hill is also the simplest: it’s a mess. And, as of right now, it looks as if that mess is going to get worse before it gets better. While it’s not exactly breaking news that Congress isn’t operating as a model of legislative efficiency, the degree to which Congress is balking at fulfilling even its most rudimentary duties is itself remarkable. As has become customary in recently years, Congress is once again behind in the annual appropriations process and it appears as if a new spending deal may have to wait until 2018. According to Representative Tom Cole (R-OK), a senior member of the House Appropriations Committee, Congressional Republicans are considering the passage of another short term continuing resolution (CR) in December if they are unable to reach a deal with their Democratic colleagues. With a little over a month left before the current CR ends and a federal government shutdown is triggered, congressional Republicans have yet to agree on any top-line spending numbers and appear to be more concerned with pushing through tax cuts. For their part, Democratic leaders have come out against the idea of a new CR and are gearing up for a spending fight in December. However, at the moment, the bulk of the GOP’s energies have been devoted to the roll out of their long sought after overhaul of the U.S. tax code. 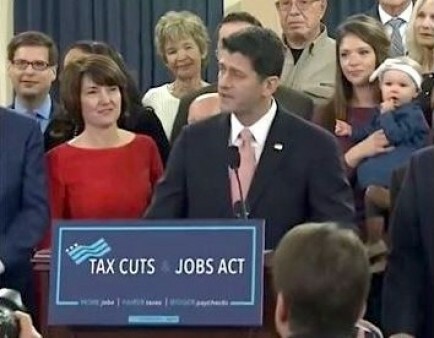 On Thursday, November 2, House Republican leadership unveiled their plan for “tax reform,” the Tax Cuts and Jobs Act. The plan, which would add an estimated $1.5 trillion to the deficit over the next decade, is focused predominantly on providing significant tax cuts for corporations and the wealthiest Americans while leaving low-and-middle income families in the lurch. At the core of the Tax Cuts and Jobs Act is a massive and permanent reduction of the corporate tax rate from 35 percent to 20 percent. The legislation would also lower the top individual tax bracket from 39.6 percent to 35 percent and eliminate both the Alternative Minimum Tax and (by 2024) the Estate Tax, both of which benefit the wealthiest Americans. Given the fact that more than 40% of people living with HIV who are in care are covered by Medicaid, these cuts could have a huge negative impact on access to and quality of care for hundreds of thousands of Americans living with HIV. Cuts to total discretionary spending for domestic programs could undermine the Ryan White HIV/AIDS Program, HIV prevention, and funding for housing for people living with HIV. AIDS United joins with multiple organizations and coalitions in opposing any tax “reform” that reduces revenue or will lead to devastating cuts in spending for entitlement programs and vital health care and safety net programs.